The British School of Brussels (BSB) is an international private school with approximately 1,350 pupils aged 1-18 and 300 employees. It offers a British-based curriculum and a wide range of extracurricular activities. BSB is located in Tervuren and is the second largest international school in Belgium. The school wanted to review its operating costs. As its own finance department was short of time, it decided to look for an external party that could carry out a thorough analysis. BSB came across Expense Reduction Analysts when it was given a referral by another international school. The British School wanted to draw on ERA’s knowledge and experience to obtain a better view of the market, including the parties that are specialised in providing a particular service and the pitfalls that need to be avoided. To find out exactly how Expense Reduction Analysts helped The British School of Brussels, including practical examples, download the full case study today. 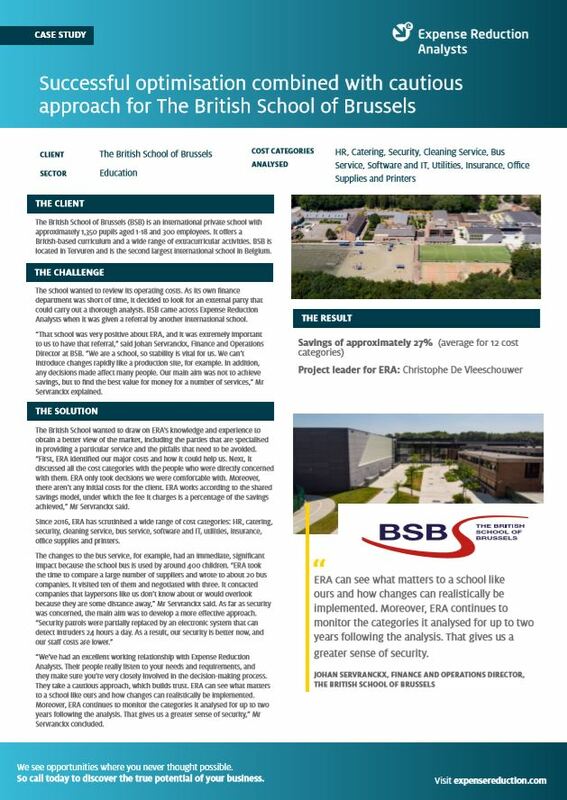 Discover how Expense Reduction Analysts were able to help The British School of Brussels by downloading the full case study today. "ERA can see what matters to a school like ours and how changes can realistically be implemented. Moreover, ERA continues to monitor the categories it analysed for up to two years following the analysis. That gives us a greater sense of security." If you would like to know more about Expense Reduction Analysts and how we can help your organisation, contact us today.